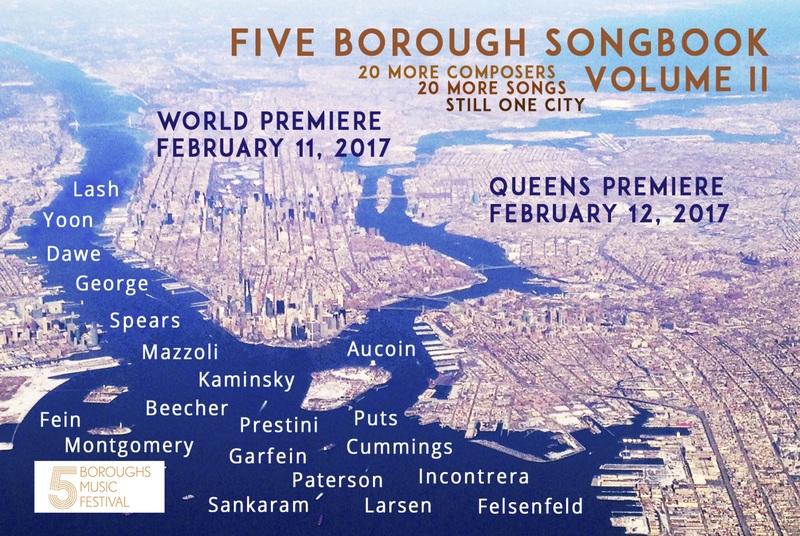 5BMF is thrilled to present the World Premiere and Queens Premiere of our brand new Five Borough Songbook, Volume II this February! Commissioned in honor of our 10th Anniversary season in 2016-2017, the Songbook is a thrilling musical journey across NYC: an exploration of the city’s rich artistic and cultural legacy and a celebration of its most manifold musical talent. Following the model of the original Five Borough Songbook – commissioned by 5BMF in 2011 for our 5th Anniversary and performed in every borough of the city that season – Volume II features twenty vibrant new works by twenty unique composers. Four vocalists, two pianists and one cellist will bring the Songbook to life through songs, duets and ensembles, all inspired by New York City places, poetry and themes. Read more about our special Five Borough Songbook project. Raphael Allison, Liza Balkan, Alastair Boag, Mark Campbell, Billy Collins, Rinde Eckert, Joyce Kilmer, Federico García Lorca, Leah Maddrie, Rick Moody, Dennis Nurske, Bimbo Rivas, Anna Świrszczyńska, KC Trommer, William Ross Wallace, Walt Whitman, and more.